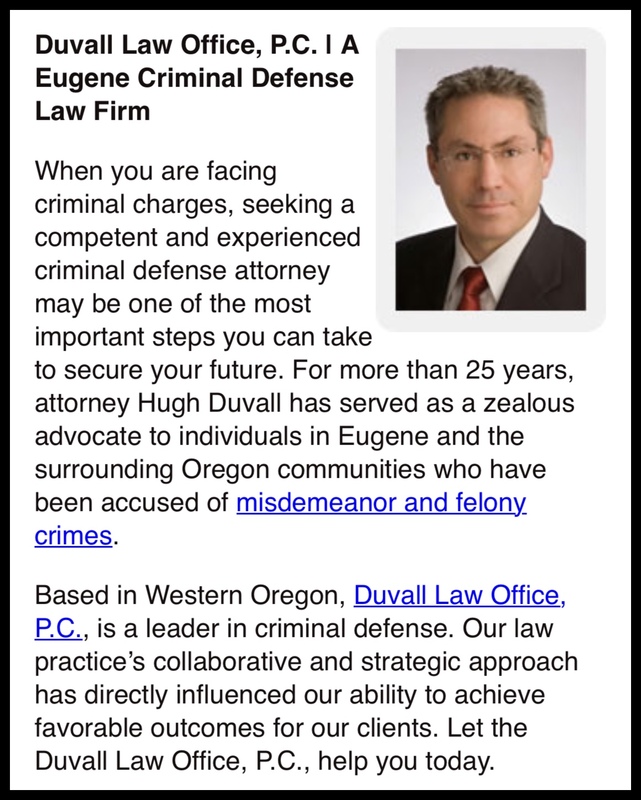 The Duvall Law Office is based in Eugene, Oregon, and represents people charged with driving crimes in the Eugene / Springfield area, and throughout the state of Oregon. If you are seeking an experienced Eugene, Oregon, criminal and/or driving offense lawyer (including driving under the influence of intoxicants – aka DUII, DUI, DWI or drunk driving), call now for an appointment. (1)(a) Upon receipt of a record of conviction for an offense described in this section, the Department of Transportation shall suspend the driving privileges of the person convicted. (b) A person is entitled to administrative review under ORS 809.440 (Hearing and administrative review procedures) of a suspension under this section. (c) Except as otherwise provided in subsections (7), (8), (9) and (10) of this section, the suspension shall be for the period of time described in Schedule I of ORS 809.428 (Schedule of suspension or revocation periods for certain offenses). The department may not reinstate driving privileges of any person whose privileges are suspended under subsection (2), (3), (4), (5), (6), (7) or (10) of this section until the person complies with future responsibility filings. There is no requirement of compliance with future responsibility filings if the person was suspended under subsection (8) or (9) of this section. (2) The department shall take action under subsection (1) of this section upon receipt of a record of conviction of any degree of recklessly endangering another person, menacing or criminal mischief resulting from the operation of a motor vehicle. (3) The department shall take action under subsection (1) of this section upon receipt of a record of conviction of reckless driving under ORS 811.140 (Reckless driving). (4) The department shall take action under subsection (1) of this section upon receipt of a record of conviction of failure to perform duties of a driver when property is damaged under ORS 811.700 (Failure to perform duties of driver when property is damaged). (5) The department shall take action under subsection (1) of this section upon receipt of a record of conviction of fleeing or attempting to elude a police officer under ORS 811.540 (Fleeing or attempting to elude police officer). (6) The department shall take action under subsection (1) of this section upon receipt of a record of conviction of reckless endangerment of highway workers under ORS 811.231 (Reckless endangerment of highway workers) (1). (7) The department shall take action under subsection (1) of this section upon receipt of a record of conviction of theft under ORS 164.043 (Theft in the third degree), 164.045 (Theft in the second degree) or 164.055 (Theft in the first degree) when the theft was of gasoline. A suspension under this subsection shall continue for a period of six months from the date of suspension. (8) The department shall take action under subsection (1) of this section upon receipt of a record of conviction of criminal trespass under ORS 164.245 (Criminal trespass in the second degree) that involves the operation of a motor vehicle. A suspension under this subsection shall continue for a period of six months from the date of suspension. (9) The department shall take action under subsection (1) of this section upon receipt of a record of conviction of an offense described in ORS 809.310 (Cancellation or suspension of driving privileges). A suspension under this subsection shall continue for a period of one year from the date of the suspension. (10)(a) The department shall take action under subsection (1) of this section upon receipt of a record of conviction of assault in the second, third or fourth degree resulting from the operation of a motor vehicle. (b) A person who is convicted of assault in the second degree and whose driving privileges are suspended under this subsection may apply for reinstatement of driving privileges eight years from the date the person is released from incarceration for the conviction, if the sentence includes incarceration. If the sentence for the conviction does not include incarceration, the person may apply for reinstatement of driving privileges eight years from the date the department suspended the privileges under this subsection. (c) A person who is convicted of assault in the third degree and whose driving privileges are suspended under this subsection may apply for reinstatement of driving privileges five years from the date the person is released from incarceration for the conviction, if the sentence includes incarceration. If the sentence for the conviction does not include incarceration, the person may apply for reinstatement of driving privileges five years from the date the department suspended the privileges under this subsection. Call the Duvall Law Office at 541-345-4500 to schedule an appointment to discuss your case. 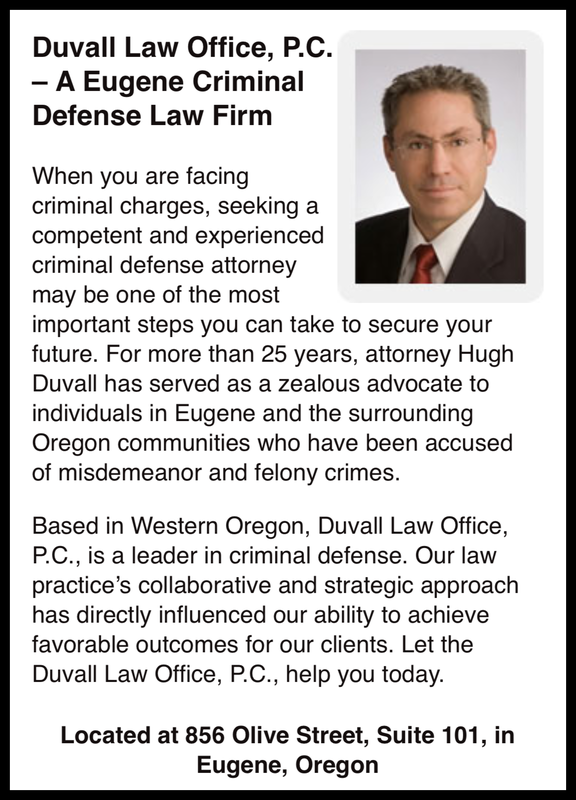 The Duvall Law Office is experienced in representing individuals charged with crimes throughout the state of Oregon. This includes Measure 11 offenses, domestic violence / child abuse charges, as well as all driving offenses including DUII (aka, Driving Under the Influence of Intoxicants, DUI, DWI or more commonly called “drunk driving”). (b) Refrain from moving from that lane until the driver has first made certain that the movement can be made with safety. (2) A person who operates a commercial motor vehicle within a multilane roundabout that is divided into two or more clearly marked lanes for traffic may operate the commercial motor vehicle in more than one lane when it is not practicable to remain entirely within one lane. An experienced criminal defense lawyer and/or drunk driving defense attorney regularly evaluates the underlying facts of a case to determine whether, in fact, the officer has observed such a violation (e.g. Failure to Maintain Lane), and whether the officer’s conclusion that the individual committed this violation of Oregon traffic law which then allowed the officer to investigate further was objectively reasonable.